There's been a lot of controversy about slapping computers onto guns lately. Gun control activists daydream about installing computerized gunlocks, and maybe GPS modules for good measure, on every gun. Gun rights activists have serious doubts about the reliability of such locks and would rather not have their guns tracked by the government. But high-tech gunlocks and computerized tracking aren't the only potential "smart gun" tech out there. The other possible applications for computers in firearms are not only far more exciting for the average shooter but are well beyond the concept stage and available to buy. The Mantis X is one of those technologies. It is a bolt-on gyroscope that's been tuned to track the tiny movements a shooter makes right before the moment the round goes off. It then analyzes those movements and scores the shot based on how much the gun moved from its original aim-point. It also shows which way the gun moved and offers advice on how to correct the problem. The Mantis X takes the form of a tiny black box with a few lights, a button, and a micro USB port for charging. 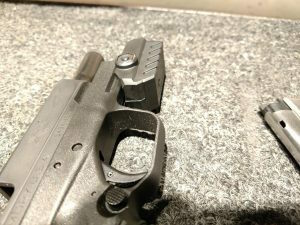 It's designed to mount to any handgun with a Picatinny rail. It's small enough that it fit onto my Springfield XDS, though I did have to mount it backwards. That didn't cause any problems because the device can account for the backwards orientation. It also takes into account whether you're left handed or right handed. It can even track dry fire exercises in addition to live fire training. In my time at the range, the Mantis X seemed to be pretty accurate. The hits on the paper matched up pretty well with where the Mantis X guessed I was hitting. The score for how much movement I had before each shot seemed pretty accurate too. At one point I purposely put way too little finger on the trigger to see if the Mantis X would catch the problem. It did. It could tell I was pushing all my shots to the left. It recommended I use more trigger finger. I also love the way it encourages people to train. It matches my preferred method whenever I'm working with students on the NRA Basic Pistol course. Once somebody has learned the basics of firearms safety, proper grip, and stance it's best to train by shooting in groups. The best results come from keeping everything from aimpoint to sight alignment to grip as consistent as possible, then firing a number of rounds before actually reviewing where you're hitting. That's how Mantis X encourages you to use the app. 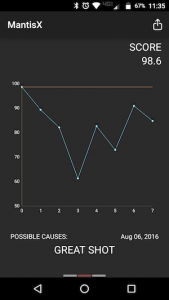 Take a couple of shots and the app grades each one between 0 and 100, as well as averaging them together. 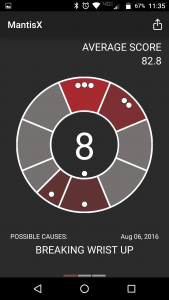 Anything below a 95 rating will fall somewhere around the outer rim of the target and into a quadrant that corresponds with what Mantis X thinks is causing you to miss your target. If you see a group of low-scoring shots in one specific quadrant, well, there's your problem. The scoring system actually makes for a pretty fun game too. Townhall's Matt Vespa and I took turns shooting my XDS while the Mantis X scored each shot. Whoever (me, obviously) got a higher average score won. It was pretty fun and a lot easier than scoring a paper target. The system isn't perfect, of course. Having to hit start and stop between magazines was kind of annoying. It should be more obvious that clearing your groupings from the app actually saves them all for review later. The UI is pretty intuitive but it could still be improved. And there was one whole magazine that the app didn't seem to register for some reason so the reliability could use some troubleshooting. 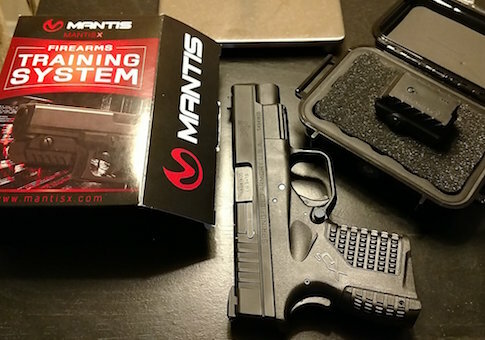 Overall, the Mantis X is an exciting step forward in the world of firearms. It's now possible to strap a tiny computer to your gun that will help make you a better shooter. The future is here and I can't wait to see what the fusion of firearms and computers brings us next. This entry was posted in Culture and tagged Guns. Bookmark the permalink.